With the rise of CO2 in Earth's atmosphere, understanding the climate of tropical forests—the Amazon in particular—has become a critical research area. A recent NASA study showed that these regions are the biggest terrestrial carbon dioxide sinks on our planet, absorbing 1.4 billion metric tons of CO2 out of a total global terrestrial absorption of 2.5 billion. To simulate the tropical climate to learn more about its processes, climate scientists have typically been relying on general circulation models (GCMs) to simulate the tropical climate. But these models exhibit biases over tropical continents, showing peak evaporation and photosynthesis rates in the wrong season, as well as rain too early in the day. A Columbia Engineering team led by Pierre Gentine, professor of earth and environmental engineering, and Adam Sobel, professor of applied physics and applied mathematics and of earth and environmental sciences, has developed a new approach, opposite to climate models, to correct climate model inaccuracies using a high-resolution atmospheric model that more precisely resolves clouds and convection (precipitation) and parameterizes the feedback between convection and atmospheric circulation. This study is published in the August 31 online Early Edition of Proceedings of the National Academy of Sciences (PNAS). "Our new simulation strategy paves the way for better understanding of the water and carbon cycles in the Amazon," says Gentine, whose research focuses on the feedback between land and atmosphere. "Our approach should help us learn more about the role of deforestation and climate change on the forest." Usama Anber, Sobel's PhD student at Columbia's Lamont-Doherty Earth Observatory and the paper's first author, simulated the Amazon climate and demonstrated the key role that the morning fog layer plays on evaporation and surface radiation. This fog layer is induced by the large nighttime precipitation, missed by current climate models, which underestimated the effect of clouds and precipitation. 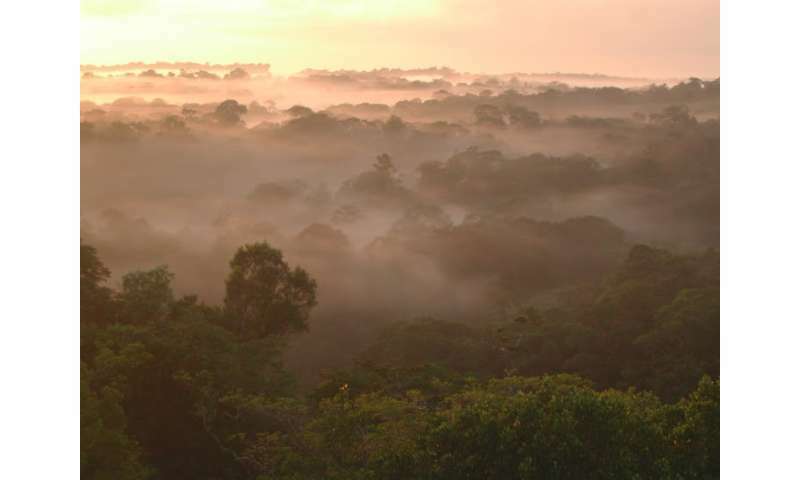 The researchers found that the fog layer is an essential regulator of the Amazon climate: during the wet season, it artificially modifies the duration of daytime because it reflects sunlight during the early morning. During the dry season, with no fog layer to reflect sunlight, the smaller cloud cover allows plants to receive much higher radiation, increasing evaporation and photosynthesis rates, another process missed by the GCMs. "Our study demonstrates that using coupled land-atmosphere models with resolved convection and parameterized large-scale dynamics produces very accurate results," Anber observes. "It is critical to our understanding of tropical climates." The team, which also included Shuguang Wang, associate research scientist in the Department of Applied Physics and Applied Mathematics, plans next to examine CO2 cycles to see if they can develop better predictions of climate changes. "If we can improve our estimations of evaporation over land, then we can also improve water resources management, and weather and climatic forecasts," Gentine adds. "Working on the hydrologic and carbon cycles is exciting because it will help determine the fate of our planet."